Glomerular filtration rate (GFR) is generally considered to be the gold standard measurement of kidney function. GFR can be calculated by measuring serum iohexol clearance using concentrations at 2,3 and 4 hours following a bolus injection. For validation, serum samples were spiked at low (0.017 mg/mL), medium (0.27 mg/mL) and high (2.16 mg/mL) iohexol concentrations. They were analysed, along with standard calibration curves (8 concentrations ranging from 0.017 to 2.16 mg/mL), using deltaDOT’s Label-Free high performance capillary electrophoresis (HPCE) system. Data were analysed using deltaDOT’s General Separation Transform (GST). Clinical and spiked serum samples were also sent for analysis by mass spectrometry (MS) at a reference laboratory (14 samples for comparison). Concentrations obtained by HPCE and MS were compared in a Bland Altman plot. GFR for clinical samples was calculated from the measured iohexol concentrations using the method reported by Bexfield (2008). A validated method was produced, with a lower limit of detection of 0.009 mg/mL and an lower limit of quantification of 0.017 mg/mL. The upper limit of quantification was 2.16 mg/mL. The standard curve had excellent linearity (R2 = 0.993). Maximum inaccuracy was less than 11.5% of the true value, except at LLOQ, where it was within 24.2%. Average within day variability was less than 13.1% at all levels, while between day variability was less than 5.6%, except at LLOQ, where it was less than 15.4%. Agreement between the results obtained by measurement with HPCE and MS was good (bias 1.3%, lower and upper limits of agreement of -15.4 and 18.0%, respectively). Method specificity was confirmed by the absence of matrix effect in six serum specimen obtained from clinical dogs. Clinical samples were analysed and GFR reported with a 3 day turnaround time. In conclusion, HPCE provides an accurate and precise method for measuring iohexol in canine serum. 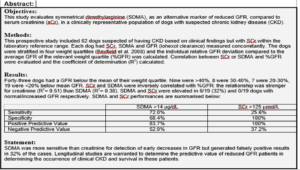 Assessment of renal function in dogs and cats –what’s new?